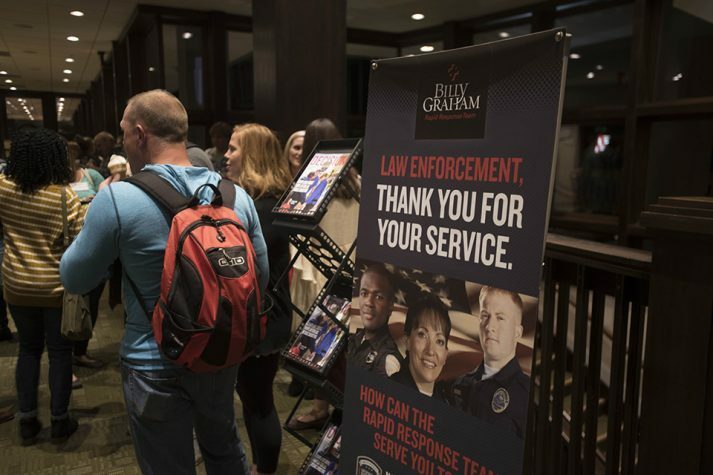 The National Law Enforcement Retreat, hosted by the Billy Graham Rapid Response Team (RRT), will be held March 31-April 2 in Horseshoe Bay, Texas (just 90 minutes northwest of Austin). The three-day event is dedicated to addressing the emotional and spiritual needs of law enforcement officials and their spouses/families. Andrew Columbia, an alumni of New York police department’s Fighting 9th precinct, knows what his fellow law enforcement officials are going through, and that’s why speaking at the National Law Enforcement Retreat means so much to him. He worked patrol in one of the toughest areas in the state, maybe even the nation. He remembers the horrible calls he answered, the unrelenting rage he felt, and the nightly trips to the bar in a feeble attempt to swallow it all away and go home unfettered. You OK, Columbia? You look like you’re going to explode. The question set in motion a night of events Columbia couldn’t have predicted, and he’ll never forget. In a rage-fueled despair, he climbed the stairs to one of New York City’s rooftops, pulled his firearm and screamed question after question at the nighttime sky. What’s stopping me from blowing my brains out? What is wrong with me? I want to know now. He wanted answers from Whoever was listening. A gentle realization washed over Columbia. He had been molested as a child, but had shuttered the memory. The rage that poured from him stemmed from that incident and was further compounded by the traumatic incidents he responded to almost daily. He had become unflinching at murder scenes and indifferent at all other calls—until that night on the rooftop in Harlem. “I felt this presence that I never felt before,” Columbia said. “This light encased around me. I just felt love. Columbia stopped drinking. He quit swearing. He read the Bible in a week. His colleagues were thoroughly freaked out. Their Ice Man was unrecognizable. One officer even commented the evil was no longer in his eyes. The anger had abated. His pain was healed. He was a new creation. Instead of angrily removing homeless people hiding on New York City’s rooftops, he treated them with dignity. He remembers hugging and praying with one man covered in urine and vomit. 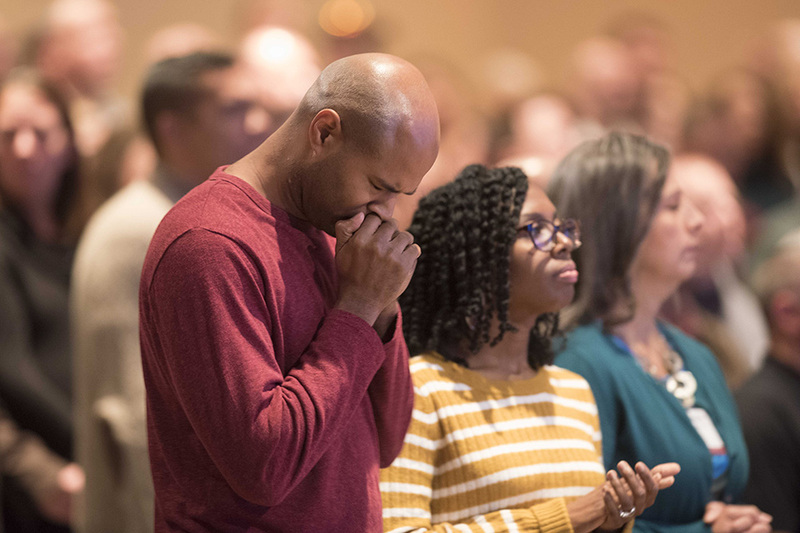 Andrew Columbia, former NYPD law enforcement official and now lead pastor of Mount Carmel Baptist Church in New York, worships during the October 2018 National Law Enforcement Retreat at The Billy Graham Training Center at The Cove. 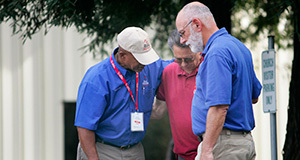 At this year’s Texas retreat, Columbia will encourage officers with a Bible-based message that includes his testimony. That’s what drives Columbia, this man who prisoners began to call “peacemaker;” his colleagues settled on “preacher.” After 20 years on the beat, he felt called to go into full-time ministry and it was during this time that he began to work directly with the Rapid Response Team. Jeff Naber, field manager of the RRT’s law enforcement ministry, remembers that first encounter. The introduction didn’t really stand out, but sometime later during the 2015 civil unrest deployment to Baltimore, Maryland, Naber heard Columbia preaching on the street corner. Naber was blown away. The passion, the authenticity, the unorthodox altar calls right there on that street corner were everything. After getting to know him better, Naber invited Columbia to speak at the National Law Enforcement Retreat. 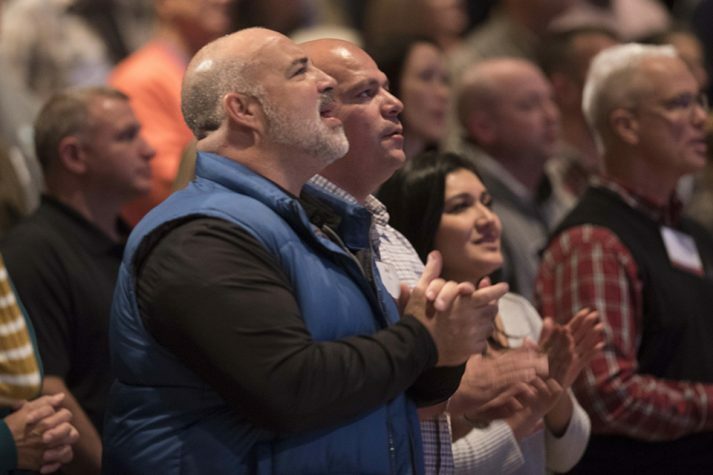 Their schedules finally worked out, and Columbia spoke during the 2018 retreat at The Billy Graham Training Center at The Cove. He shared from the stage just like he did from that street corner, and people began responding, particularly at the final altar call. One officer debating suicide felt compelled to come forward and give his life to Christ. One spouse found healing after sharing for the first time with her husband that she, too, had been molested as a child. Another thanked Columbia for openly discussing the prejudice that exists in the law enforcement profession. Columbia, a crisis-trained chaplain with the Rapid Response Team, continued this ministry role with folks after the retreat ended. He made a point to stay in touch via social media. “I want to be that lifeline and share,” said Columbia, who is lead pastor of Mount Carmel Baptist Church in New York. “That’s why I’m so passionate about doing these events, and I’m so grateful to be part of the Rapid Response Team. I was one of those guys that could have gone either way. For me, it’s very personal and very real. You, too, can learn how to handle this life. Find peace with God today. The National Law Enforcement Retreat will be held this year in Texas (March 31-April 2) and North Carolina (Oct. 21-23). Please continue to pray for those who decide to attend as well as those appointed to share God’s truths at these events.